If you were anything like me as a kid, you probably used to think, “When I’m a grown up I can have ______ for dinner every night!” (insert: icecream, cookies, poptarts, cotton candy etc.). But now that I finally am a (sort of) grown up, I know I have to suppress my inner-child demands in favor of not weighing 500 lbs. But I recently discovered a way to have my cake and eat it too. Well, fruit roll-ups anywho. 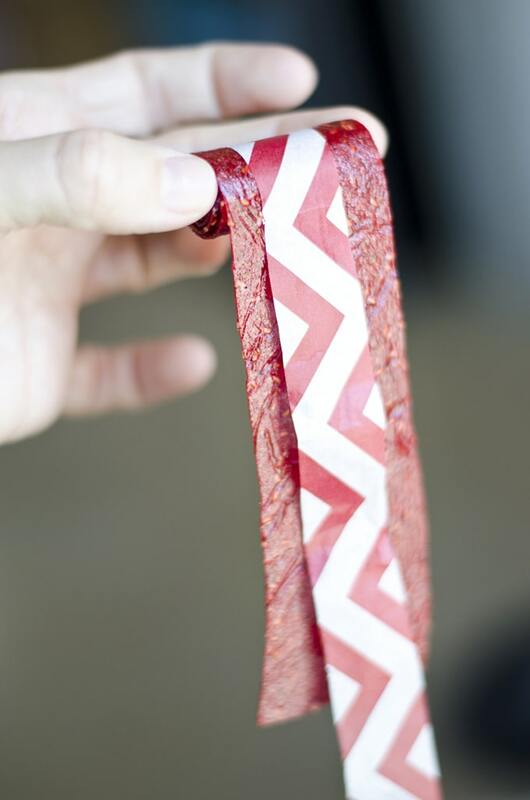 When I first came across a recipe for a similar fruit leather type thing, I was suspicious. You mean to tell me I can use my oven as a dehydrator? I don’t need one of those fancy shmancy things? I figured I would have to give it a couple tries, some old fashion trial-and-error, but alas, the first try was a major success! I’m talking major, these things are really good. 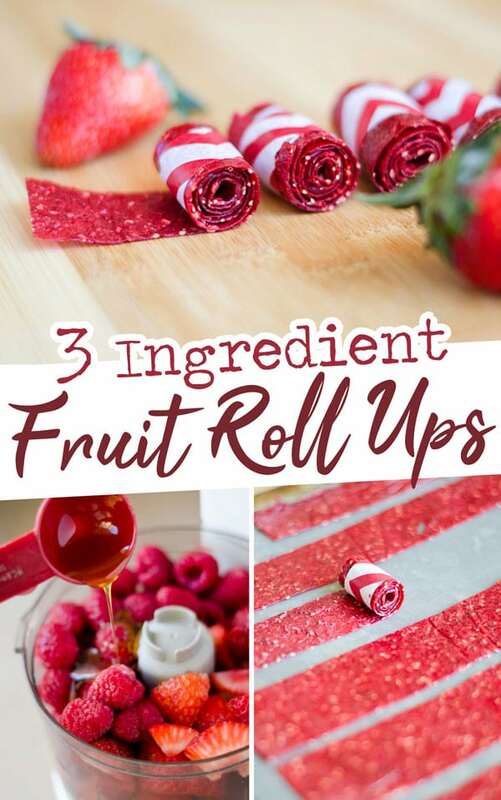 What do you need for natural fruit rolls ups? You just need 3 ingredients: fruit, lemon juice, and something to sweeten it. You’ll blend it all up, spread thin on a lined baking sheet, then bake at a very low temperature for a few hours, until dried. I used a mixture of raspberries and strawberries (about 3 cups) for my base. The sweetness is really to your taste. 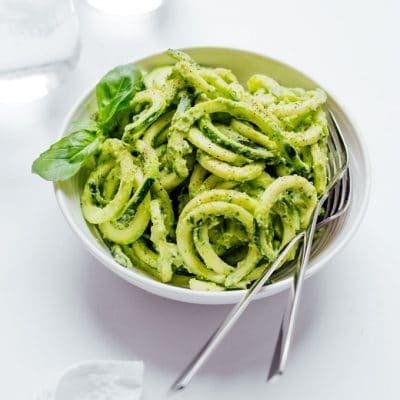 You can use honey or Stevia / Truvia / Sugar (2-3 tablespoons). And finally lemon juice (2 tablespoons) keeps the bright color of the fruit. 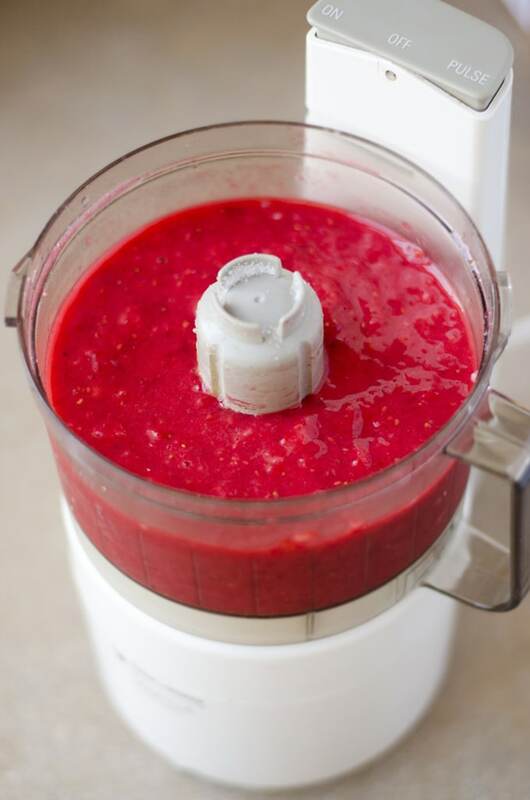 Blend all the ingredients in a food processor or blender until it’s as smooth as can be. Next, line a baking pan or sheet with a good quality plastic wrap or parchment paper. Pour the blended fruit mixture onto the lined pan, then spread it out with a spoon or spatula. It should be as thin as possible without forming holes, about ⅛ – ¼ inch thick. Your oven! That’s right, just let your homemade fruit roll-ups dehydrate in the oven, using as low of temperature as your oven will go. The temperature you dry it at determines the time needed, and can range from 4 to 6 hours. It’s finished when the middle is no longer tacky. The edges may get too dry, in which case you can rehydrate them a bit by rubbing them with water. 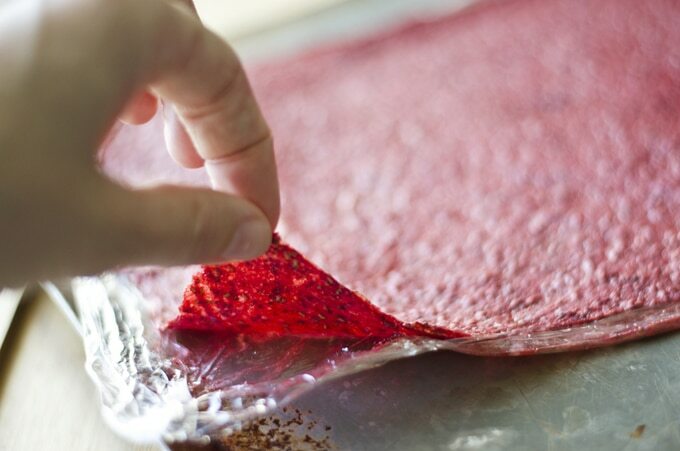 Once dried, let the fruit leather cool, then remove from plastic wrap (alternatively, leave the fruit leather on the parchment paper and just cut into strips). Cutting with a clean pair of scissors makes this go quickly! Remove the edges then cut into 1 inch wide strips. 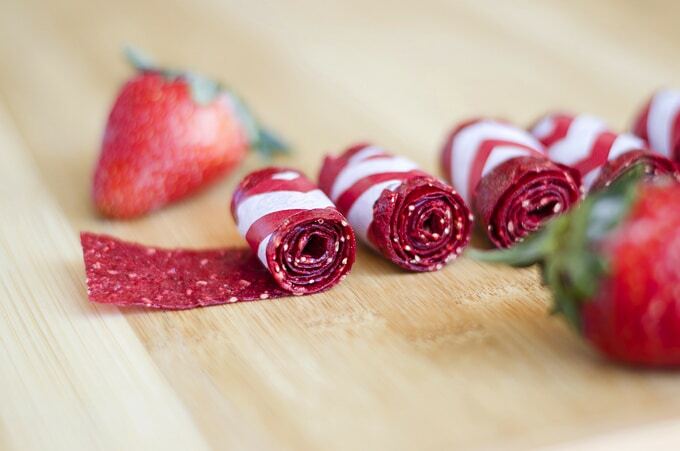 For the true fruit roll-up experience, cut strips or parchment or tissue paper and roll the fruit into the paper. Use a touch of tape or string to hold it all together. 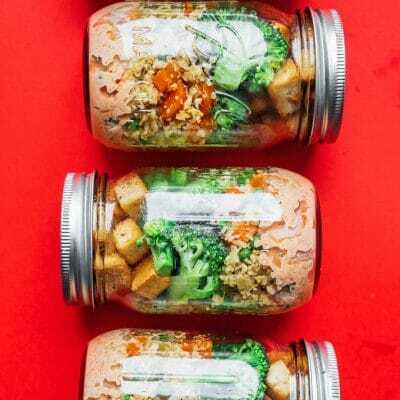 Store in an airtight container in the fridge for up to 2 weeks. It will last even longer if you add a paper towel in the container, which will help absorb moisture. 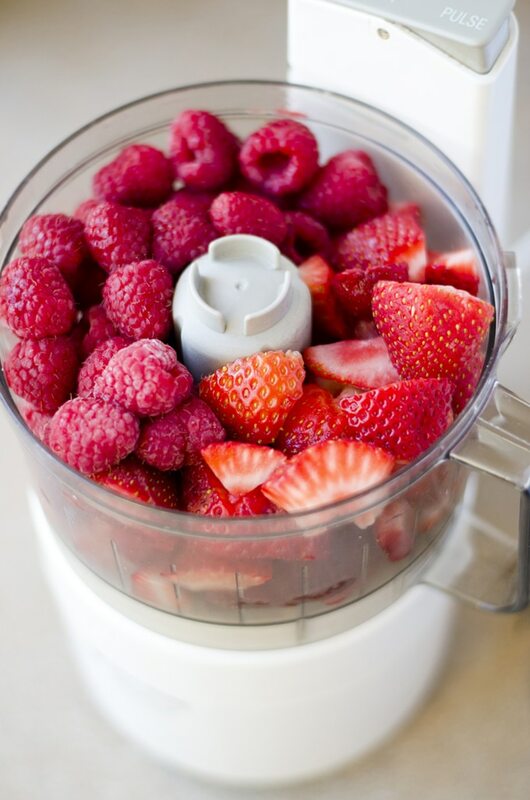 Blend: Blend fruit in food processor or blender until smooth. Mix in sweetener and lemon juice. 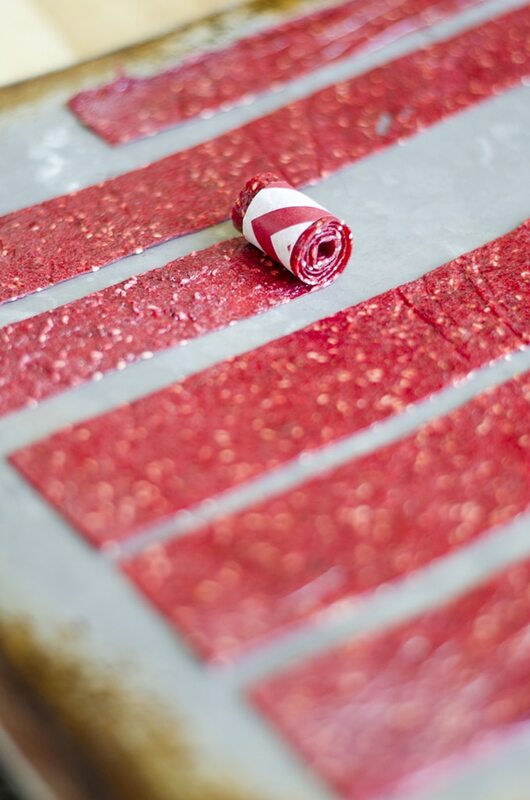 Spread: Pour into a pan lined with plastic wrap or parchment paper then spread out ⅛ to ¼ inch thick. Dehydrate: Dehydrate in oven at 140 to 170 degrees F (or as low as oven will go) for 4 to 6 hours, or until the middle is not longer tacky. Cool: Allow to cool, then remove from sheet. With clean scissors, trim off edges then cut into 1 inch wide strips. 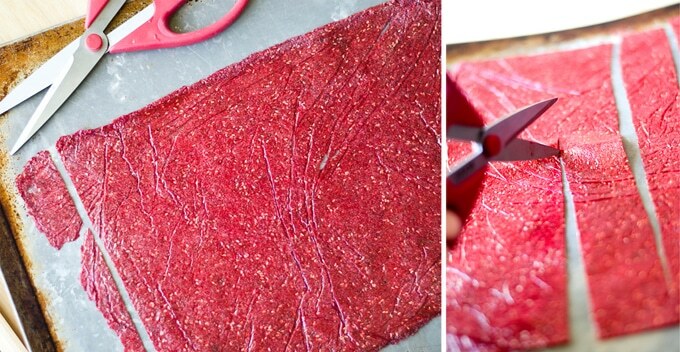 Wrap with strips of parchment or tissue paper, then use tape or string to seal. You can put the plastic wrap in the oven? Would it be alright if I used parchment? You know, I was pretty surprised by this too. But I think the combination of a good quality plastic wrap and a low heat prevent it from melting. It held up just fine! But the parchment paper is actually a great idea! 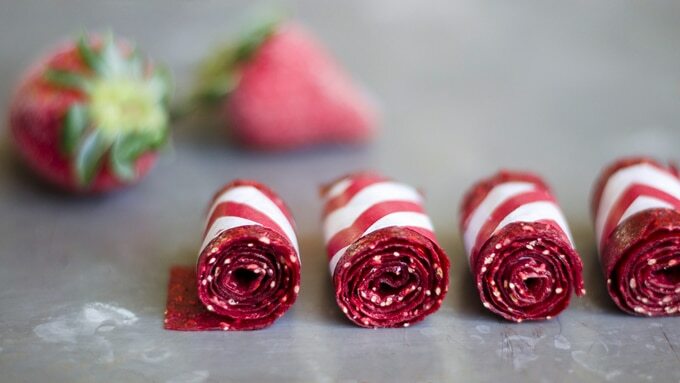 You could just leave the fruit leather on the parchment paper and cut it into strips with the paper on. Saves time and materials! Great thinking, thanks for the input! Oh goodness yes, Fahrenheit! Thanks for pointing that out, I’ll clarify it in the recipe. It should be about 60 to 75 degrees C.
Thankyou I know its a pain having to think of those in countries that use the metric system 😛 sweet I’m well up for making these thanks for getting back to me. Hi Shirley! Do you mean you tried to vote for the Saveur Blog Awards? Would you have to oil the parchment paper? Ps-I tried to give it 5 stars, but it wouldn’t let me. These are awesome! Hi Trynna! Nope! 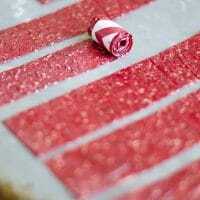 You could just bake them on the paper then cut it into strips right on the paper. Once cooked, they won’t be sticky or tacky and will peel right off 🙂 Thanks so much for the attempted 5 stars! Glad you like em! Just wondering how you store your fruit roll-ups? Hey Lindsey! I just store them in an airtight container/bag at room temperature. They should stay good for quite a while because they are so low in moisture. could i use frozen fruit? Made these today & my picky three year old son approves. Used 1 cup strawberries & 1 cup blueberries. Tart & sweet. Only minor issue was 6 hours wasn’t long enough for the middle. Wanted to leave them for another hour but hubby wanted the oven to make deer jerjky. No problem…the piece in the middle just rolled it up into a big sticky bite. Can’t wait to experiment with different fruits! This looks fabulous! Do you store them in the refrigerator, or at room temperature? 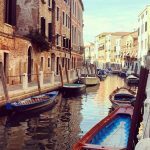 I’m sure they’ll go quickly in my house – but how long do they stay good for? What a great recipe! I’m including a link to it in my latest post about simple recipes kids can make. It’ll be posted tomorrow. Thanks for the inspiration! Do you use the same ingredients with acidic fruits such as pineapple? Also, is it possible to use apple and pear? This looks awesome! Do you think using aluminum foil will work as well? Thanks, Annie! I think it would work, but I have’t personally tried it! Made these for the first time the other night. Made about 4 cups of strawberries and placed them in the oven at 170* (lowest my oven will go) set the timer for 4 hours…. still wet… added another 2 hours… still wet… 14 hours later they were finally not wet/runny. Tasted them…. HORRIBLE! Not sure what I could have done differently but my kids are begging me never to make them again. Definitely parchment paper! Thanks for the recipe! I want to make these for my grandkids but they would not like the seeds. I wonder if a cheesecloth could be used to get as many seeds out as possible. thoughts? I think that would work well! That or a wire mesh sieve. The sieve would block the bigger seeds from getting through while letting through all the nice fibers that give this structure. Hey just wondering if you can use motts fruit applesauce it has blueberry, raspberry, apple and pomegranate? Anyone ever try. Hi Arlene! I haven’t tried before but I think it would work! I used parchment paper (no oil or cooking spray) and it worked great! We used strawberries, mango, honey, and lemon juice. Very good!! Thank you for this recipe. 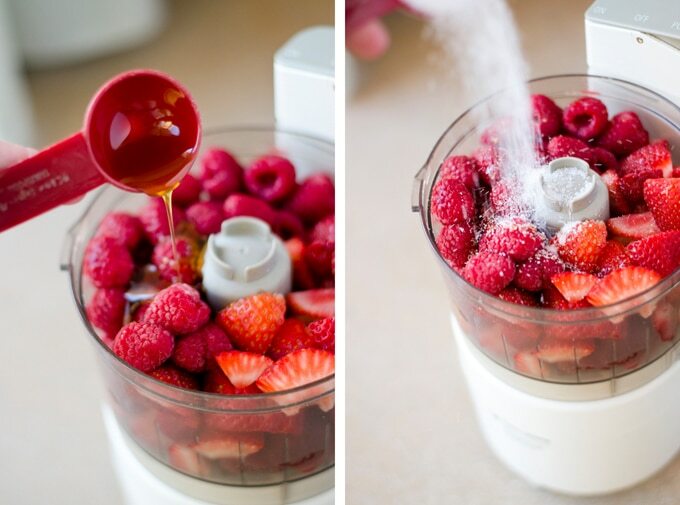 Is it possible to do it with every sorts of fruit? Hi Elisa, I’ve tried with all kinds of berries and with plums, and have heard from people that mango and pineapple work well! 😀 Happy Easter to you too! Hi there, these look great! I’m just wondering how long they can be stored for. 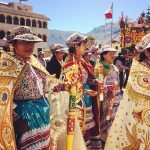 I’m looking to make a heap for an event, and so I’d like to start two or three weeks ahead. Will they keep that long? Do you have any tips in terms of storing them for three weeks? Thanks! Thanks fo posting these! My Little guy was just diagnosed diabetic and I keep looking all over for alternative and healthy treats so thank you so much. In the oven now so here’s to hoping he loves them. Also I love SO much that you included nutrition info. Makes it SO easy for me! Hi Kimberly! So happy I could help make this time a bit easier for you. I can only imagine the complete lifestyle overhaul it must be. Did they turn out well for you? Since I prefer agave, would agave be a suitable substitute for honey? If it’s just for the sweetness, I’d assume so. Hi Ruby! I think bar form would be too thick and they wouldn’t fully dry out. You could try adding agar agar to the mix (or gelatin if you’re not vegetarian), which would turn the fruit mixture into a fruit bar. Enjoy!